The Nepali version of Mother’s Day is different from the Western world. 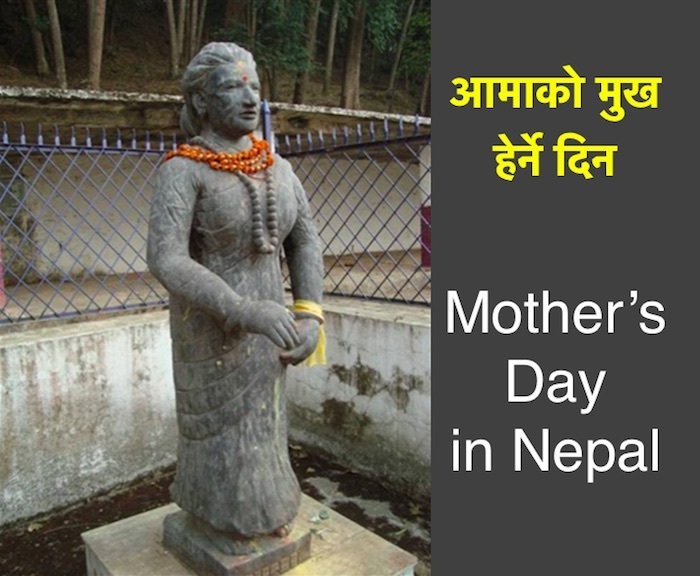 The festival to respect and show love to one’s mother people in Nepal – people celebrate Mother’s day on the new moon day of Baisakh, the first month in Nepali calendar. This year, in 2018, the festival falls on April 15, 2018. The festival is commonly known as ‘Aamako Mukh Herne Din’. The literal translation of Aamako Mukh Herne Din is “the day to see the mother’s face”. The festival is also known by the name Matatirtha Aunshi (मातातीर्थ औंशी) – a day to go for the pilgrimage of one’s mother. Those lucky people who have their mothers alive and living in nearby place go and meet them and offer foods and gifts. For those whose mothers have already died, they perform a puja to remember the mothers. Traditionally, in Nepali culture, a mother is considered ten times more respectable than a father – yes, that is 10 times! On the day, a lot of people gather in in Matatirtha, a place located in the Western part of Kathmandu valley, to remember their mothers. The people bath in the Matatirtha tap. They also look in the Matatirtha pond to see images of their mothers in it. IN Dewapar Yug, a time thousands of years ago, an orphan shepherd boy was eating his lunch. While sitting beside the Matatirtha pond and eating bread, he accidentally dropped a piece of bread in the pond. As he tried to grab the bread from the pond, he saw his mother’s face on the reflection. He was pleasantly surprised to see his dead mother’s lovely face in the pond. He was so happy to see the face that he started crying. By coincidence, the day was the new moon day of Baisakh. The mother’s image in the pond told the boy not to cry and told that she was always with the son. She also promised to meet him every year, on the same day at that same location. When other people in the village heard about the story from the shepherd boy, they also rushed to the pond. All those who looked into the pond saw their mothers in the reflection. Although this is a fable and nobody actually sees images in their mothers in the reflection of water. Thousands of people go to the place to pay respect to their mothers. To give an image to worship, a statue of a woman named ‘Aama’ (mother) has also been constructed in the place.